A glossary of drainage correction terms used to explain common foundation drainage problems and solutions. If you have any uncertainties about implementing drainage correction, contact us. We also invite you to read our Solid Foundations blog as well as our FAQ page to gain a better insight into our approach to resolving foundation drainage problems within the DFW Metroplex. Aggregate – The part of the concrete mix comprised of sand and gravel. Typically this is approximately 65% by volume. The other part is a paste consisting of concrete and water. Benchmark – That point of an elevation that defines the standard, and from which all other points are measured. Catch Basin – Where foundation drainage correction around a house is concerned, a catch basin is the part of a surface drain that is connected to a drainpipe, collects water from the surface, and then disperses it. This type of catch basin should not be confused with a catch basin used for storm water drainage purposes. 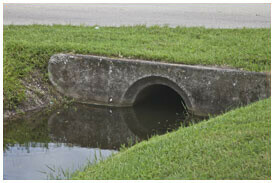 Culvert – A drain (pipe) that is used to move water under a road or other obstacle. Discharge – The rate that water is flowing from a particular pipe or chamber to another point. It is often measured in gallons or the number of feet per second. Ditch – A narrow channel or depressed in the ground that is designed to collect water. Some ditches direct water to an outlet while others do not. Drainage Correction – The removal of excess water (either surface water or groundwater) by employing the use of drainage systems, ditches or other systems. Would you like more information? If so, please study our drainage correction resource page. Drainage System – A system utilizing pipes, tubes, channels, ditches and many other means to collect and transport water from one place to another. To learn more, click here: drainage systems. Erosion – The deterioration of the soil or surface by rain, wind, water and weather conditions. Other things can also lead to erosion. Floodplain – Land positioned adjacent to a river or stream that is known to flood when the body of water next to it overflows. Foundation Drain – A drain this is essentially a pipe designed to transport water away from a foundation. 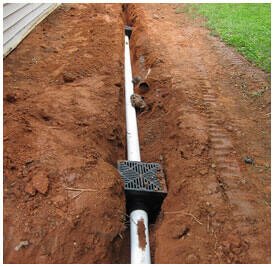 French Drain – A sub-surface drain that is designed to collect moisture that is seeping into the ground. French drains are not meant to control large amounts of standing water or surface water. These heavily perforated drains are generally positioned within a trench composed of rocks and gravel. They disperse water by sending it downhill or else directing it to a pump. Because French drains and other sub-surface drains do not collect large amounts of water, surface drains are more commonly used for foundation drainage correction. Read more about French Drains vs Surface Drains. Gradation – Stair-stepping (sloping) the ground surface to control water flow and erosion. Grade – The slope of the land. It’s important to have a proper grade in order to ensure that water flows downhill, away from property. One hundred year flood – Flooding condition that only has a 1% possibility of taking place in any particular year. Statistically speaking, a property located in a 100-year floor plain is only likely to flood a specific area once every 100 years. Negative Slope – A slope directed towards a foundation. A negative slope must be corrected to prevent moisture from accumulating under or around a foundation. Positive Slope – A slope directed away from a foundation or structure. PVC Pipe – Polyvinyl Chloride pipe. Commonly used in surface and sub-surface drainage systems. Reservoir – A man-made or naturally occurring body of water such as a pond for the purpose of regulating and containing water in order to prevent damage. Saturation – When soil has absorbed so much water that it cannot absorb any more without releasing the same amount. 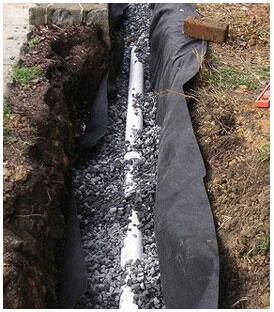 Sub-Surface Drain– A trench-like structure containing a pipe that is used for collecting and dispersing water that is seeping beneath the soil. 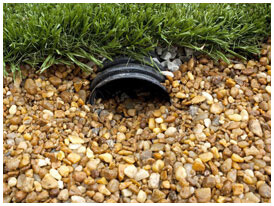 It can also be used for collecting small amounts of surface water A French drain is an example of a sub-surface drain. Surface Drain – A drain that collects water that is forming on the surface of the ground. A surface drainage system is comprised of pipes or tubes that are installed below ground for the purpose of collecting and moving large amounts of water to an outlet. These drains are typically installed in areas that would not naturally. Surface Runoff – Water (rainfall or other forms of precipitation) that is not absorbed by the ground soil or any other surface, and runs off the ground or surface to another point. Swale – A mount of dirt that can be man-made or natural and is specifically designed to direct water in specific directions. They are frequently embellished with flowers and plants in order to blend in with the landscape.